TMI Tuesdays: Enter the Ultimate Shadowhunter Fan Sweepstakes! Want to read City of Heavenly Fire a day early? Then this is a sweepstakes you won’t want to miss! Test your Shadowhunter knowledge and enter for a chance to receive a copy of City of Heavenly Fire the day before it’s released. 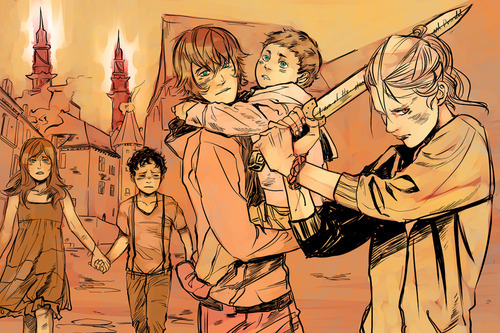 Clare also shared a postcard of a scene from City of Heavenly Fire as drawn by Cassandra Jean. It features the Blackthorns and Emma in Idris. 13 Comments on TMI Tuesdays: Enter the Ultimate Shadowhunter Fan Sweepstakes! One day before it’s released? And how do you get it? The rules explain a lot. I realized this after I tried to enter. It was a waste of time. Can you enter if you live in Australia? At times like this I wonder……WHY DO I LIVE IN ENGLAND??????? I guess i can’t either. Denmark is pretty far from USA… 😥 And i don’t think i would be capable of waiting any longer!! !